You deserve to drive a vehicle with technology features that excite you. As you are looking for a midsize sedan to purchase, you should think about the features that each vehicle offers and the way that each vehicle will entertain you as you drive. Check out the Ford Fusion and all of the technology features that it offers. 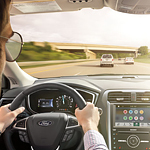 If you would like to have access to satellite radio while driving through town or while heading off on a long road trip, you can have that when you drive the Ford Fusion. You can get a Sirius XM connection set up in your Fusion. If you would like to not only listen to satellite radio while on the go but also have easy access to everything available online, you will be interested in the option that you have to turn your Ford Fusion into a hotspot. You can get a Wi-Fi connection set up in this car.